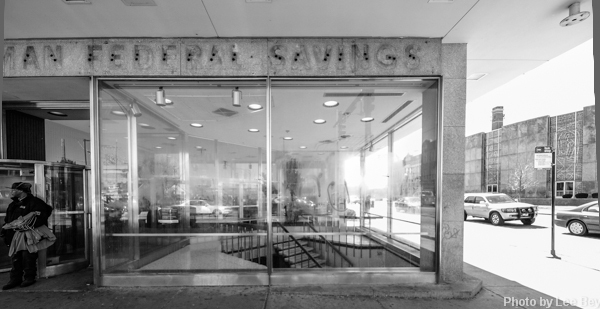 On an unexpectedly mod corner in Gage Park, could a midcentury bank be at risk? The Gage Park community is a classic city neighborhood with the ranks of Chicago bungalows, brick two-flats and other buildings constructed before the Great Depression. But the working class neighborhood went a bit go-go in the 1950s and 1960s, and the result is some unexpectedly modern buildings turning up here and there in the mainly pre-War landscape. 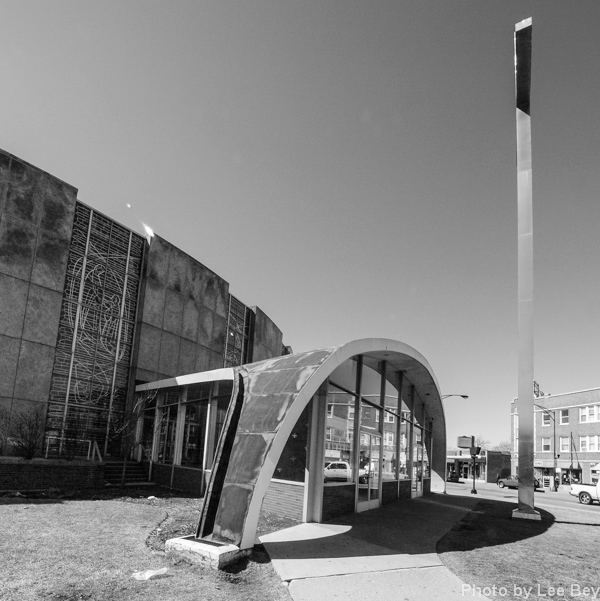 A prime example is the corner of 55th and Kedzie, which boasts the former Talman Federal Savings & Loan, the midcentury gem by Skidmore Owings & Merrill seen above and St. Gall Catholic Church, a curved modern stunner with a 60 foot stainless steel crucifix in front. The church was designed by the unheralded (but quite worthy) Pavlecic Kovacevic & Ota. Built in 1956, St. Gall is in use and I&apos;m not worried about its future. But I wonder about the long-vacant Talman Federal. The block long building has been vacant for years and is currently for sale. 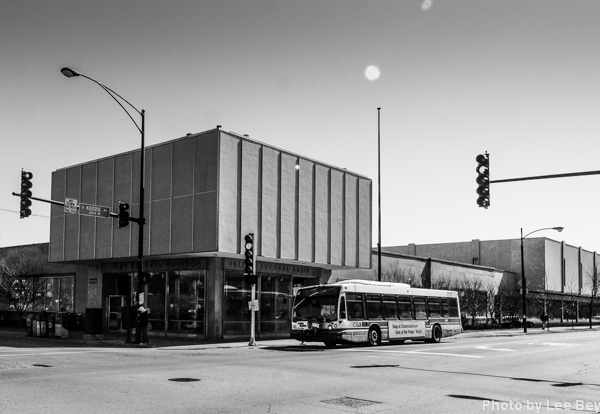 Given it occupies a well-traveled corner and has surface parking present and zoned-in, I fear a pharmacy chain or another retail coveter of spots like this will demo the building and break up this intriguing pair of modernist buildings. Especially as the economy picks up a bit. The former Talman S&L was built in 1955. Along with mechanical revolving doors and heated sidewalks, SOM gave the bank a glassy corner lobby that leads to the banking floor. The boxy, overhanging second and third stories are clad in blue tile. 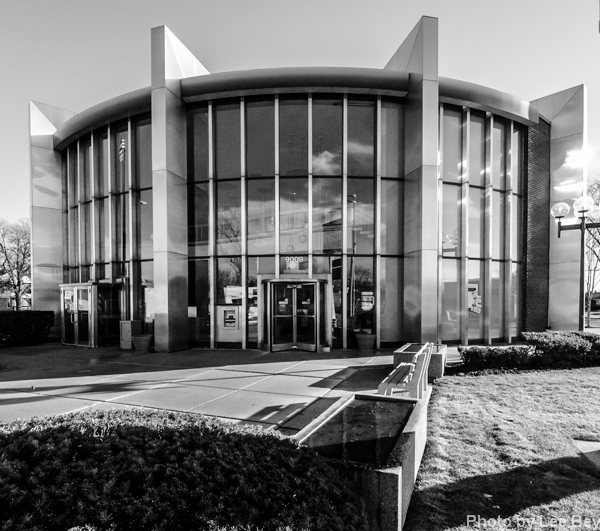 The design won a Certificate of Merit award from the Chicago chapter of the American Institute of Architects in 1957. 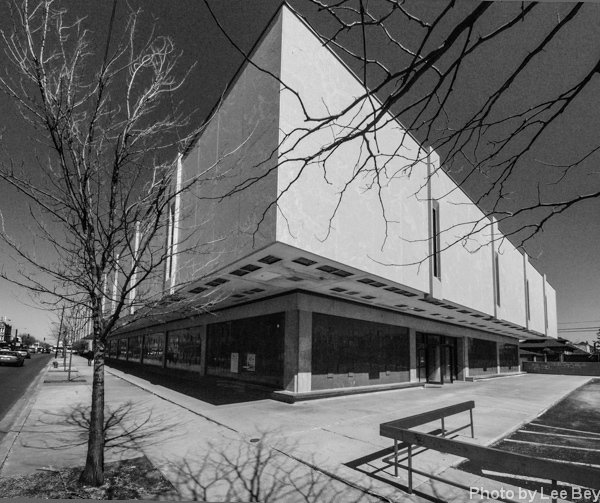 A major three-story addition to the south in 1968 took its design cues from the SOM building. Could the building be repurposed? Might there be another use for the office spaces and facilities within? Could it become a library, a public school or a community center? It&apos;s a conversation worth having, while we can. On a single intersection, two cathedrals—one to God, the other to Mammon—have stood together for almost 60 years. Here&apos;s hoping there is room enough and time enough for them both. About Pavlecic Kovacevic & Ota, the now-defunct architecture firm that designed St. Gall&apos;s: The small firm operating around Chicago and suburbs is worth researching and revisiting. I&apos;ll close with this gem, the firm&apos;s former Brookfield Savings and Loan (now Citibank) at 9009 Ogden in Brookfield.